Cuffed by His Charm is intended for mature audiences. Book #4 in a pretty good series, but Cuffed seemed to read a little slower for me. I loved Gabe's character, and he and McKenna had some great longing going on in previous books, so I was excited for their story. But I found myself skimming a tad overall and I think maybe too many mundane details did the story in for me. Still, a nice finale to the four alpha male, millionaire, playboys and their finding love and happiness. What does a multi-millionaire businessman do when he thinks his employee has taken his and his friends' secrets and sold them to the tabloids? He gets answers, it might not be the answers he was looking for, but still answers. Gabe O'Keefe is the owner of many pubs across America and when he learns that the one woman he has wanted for the last year has sold his secrets to the tabloids, he wants revenge and answers. But first he wants her, and he will not be easy because his anger will not let him. But when he learns the truth, he feels guilty for using her like he did without getting answers first. McKenna Archer has never had an easy life, first her drunk of a mother and now her addicted brother. She has tried to help him, but what she needs to do is throw him in rehab and leave him there. Because he isn't doing anyone any good now. So when Gabe comes to her and she learns why, she knows it is her brother that has betrayed her once again. Can McKenna accept help from Gabe and his friends, the only people to be there for her? Will Gabe forgive her brother for McKenna's sake? Will McKenna choose her brother over Gabe in the end? Will Gabe and his friends get their revenge on the tabloids in the end? I love Stacey Kennedy's writing style and this story was great, I need to go back and read the rest of this series too. I loved Gabe and the way he wanted to protect McKenna, and she drove me crazy with the way she always bailed out her brother, but he was family and that is what you do for a family until you have had enough. I loved this one and hope you do too, so enjoy. I liked this book but there was something that felt a bit "off" to me. The issue with McKenna's brother was the plot twist that changed the game for her and Gabe. Gabe's reaction to McKenna's alleged betrayal was off-putting to say the least, and took a while for me, as the reader, to see beyond his actions. A lot of things happened in a short amount of time, which is good for an action-packed story. What bothered me was how fast McKenna seemed to get over how Gabe treated her and what's more, blamed herself for the bad things that happened to him and his friends. This is Gabe's story. 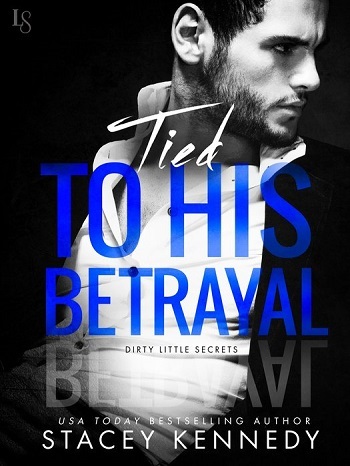 He is being hounded by the tabloids and he doesn't really know what to do when he finds out that someone from inside one of his establishments is the betrayer. He is angry and does something that ultimately made me really dislike him as a man and as a dominant: he took his anger out on McKenna by sleeping with her – it was him trying to get her out of his system. McKenna has had a difficult life. She is also trying to keep herself above water because her brother, who is troubled, has been living and sponging off of her for a while, and when he finds himself in trouble, she enables him to get him out of trouble. McKenna has always been attracted to Gabe, so when he comes to her and she finds herself in his arms, she thinks finally something is going to go right for her. However, she finds herself not basking in the afterglow of their encounter, but faced with an angry Gabe who accuses her of betraying him and his friends. What follows is the tale of how Gabe needs to find a way to redeem his horrible behavior, McKenna's past is revealed more and more and finally, whether or not Gabe and McKenna find their own happily ever after. I do wish that Alex would get her own story, as she was one of my favorite characters throughout. I enjoyed this book, though I have to say it was my least favorite in the series so far – the story just wasn’t as intense as the previous characters stories. Gabe is the owner of a chain of pubs by day and Club Sin by night. He’s decided to take a break from the CEO life and just work in one of his pubs – he’s taken quite the liking to one of his most recent employees and though things are pretty hot between them, he knows getting involved with an employee would be risky. When a tabloid runs a story about his personal life he’ll do anything to find out who leaked his story, when he finds out it’s the gorgeous bartender, McKenna, he sleeps with her, then fires her. McKenna can’t believe that after all these months of sexual tension Gabe’s finally acting on it… only to fire her right after for something she knows she didn’t do. Heartbroken and hurt, McKenna assures Gabe it wasn’t her, then walks out and Gabe can’t help but to wonder if she may be telling the truth. The chemistry between Gabe and McKenna is undeniable, but I have to say that was probably my favorite part about the book. There were almost too many details – it made it so that I was skimming a lot more then I would have liked. I don’t know that this is the last book in the series but it will most likely be the last one I read. This is the fourth book in the series – and we have been working up to this episode for a while, so I would recommend that you read them in order to get the full force of this installment. We also get a nod to the Club Sin series too, which is fun for the loyal fan! Gabe and McKenna have been skirting around their attraction to each other forever, so what happens at the beginning is a massive shock to the system, and completely out of character. It takes a little while to get over that, even with everything we know about Gabe. But the twists and turns mean that he is now going to have to do the very opposite to that which he planned, and may still lose the girl. The plot works perfectly at ramping up the tension, both in terms of the Gotcha! issues and romantic ones. Super hot, a working resolution, and another man off the market! Thank you, Ms. Kennedy. For reviews & more info, check out our Restrained Under His Duty post. Reviewers on the Wicked Reads Review Team were provided a free copy of Cuffed by His Charm (Dirty Little Secrets #4) by Stacey Kennedy to read and review.